Signs Pricing Guide, for Sign Painters and Sign makers. Signs Pricing Guide walks you through step-by-step sign pricing with estimating how-to. Signs Pricing Guide also has 4 different pricing zones. For Sign Painters this is mandatory to keep consistent pricing too avoid loosing profits. 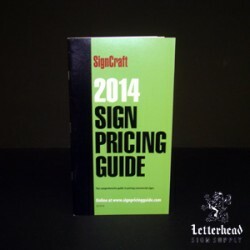 The Signs Pricing Guide is updated yearly by drawing upon bids submitted to the publishers from some of the most recognized Sign Artists. Paperback by Signcraft magazine 46 pages in color. Click here for more information and pricing on the Signs Pricing Guide.